Garmin BlueChart g3 Vision Europe charts are available in three sizes; Small, Regular and Large (the larger the chart, the more coast/water/sea is included in the coverage). Scroll down this webpage to view all 'Large' Europe Garmin g3 Vision BlueCharts. Garmin BlueChart g3 Vision Large charts are perfect for adding extremely rich marine cartography charts to compatible Garmin marine chartplotter. Read more about Garmin BlueCharts g3 Vision (Large, Europe). Large charts available to buy include Northern Europe, Europe Atlantic Coast and Southern Europe. Only Garmin BlueChart g3 Vision charts are avialabe in Large sized format. 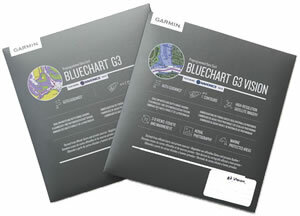 If you require the non-vision version (g3) then please consider the Regular sized Bluecharts instead. The SD cards then plug-and-play in compatible Garmin marine devices. The Garmin g3 Vision BlueCharts that we sell will operate on a Garmin chartplotter with an SD/microSD card slot (older devices with DataCards are no longer supported) but will not work when used with a Garmin handheld device. For full compatibility please see an indivdual BlueChart page e.g. Europe Atlantic Coast. All Garmin BlueCharts are supplied on preprogrammed microSD card inside a full size SD card adaptor - Learn how to install Garmin BlueChart maps SD/microSD Card onto your Garmin marine chartplotter/handheld GPS device. Not sure which Garmin marine or handheld GPS model you have? Simply email us, or use the online form on our contact us page and provide us with the unit's model, part and serial number normally located on the underside of your GPS system. We'll then reply with the relevant webpage of available Blue Charts for you to browse. To ensure you receive the very latest version of the Garmin marine chart for your device, which is currently v2019.00 (V20.5) our Garmin BlueCharts are made to order and despatched same day*. *Orders placed Monday to Friday before midday (UK time). All of the Garmin BlueCharts available from ActiveGPS come supplied on preprogrammed plug-and-play SD/microSD Cards that insert directly into your Garmin devices SD/microSD Card slot. What's more all g3 vision charts purchased from ActiveGPS come with a FREE new chart guarantee valid for 12 months after purchase.